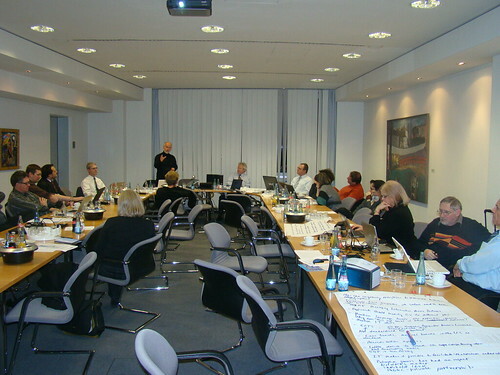 The main purpose of the workshop was to obtain feedback from a range of key stakeholders, including practitioners, managers and policy makers on the two prototypes developed by TUG and FHNW. Simone Braun presented on ontology maturing, evaluation, and lessons learnt at this year's ODBASE 2008 conference, which is one of the five complementary conferences of the OnTheMove Federated Conferences & Workshops. MATURE organized this year's OntoContent workshop, which forms part of the OnTheMove Federated Conferences 2008 conjoint with the QSI workshop. This year, a total of 20 papers were submitted to OnToContent+QSI out of which we accepted 8 for presentation at the workshop and publication in the proceedings. Simone Braun chaired the event and provided a short introduction into MATURE and the approach of Ontology Maturing as a dynamic perspective on ontologies. This year's International Semantic Web Conference took place in Karlsruhe where it was co-organized by FZI together with the University of Karlsruhe.